Would the Ottawa Senators trade Cody Ceci to the Toronto Maple Leafs? 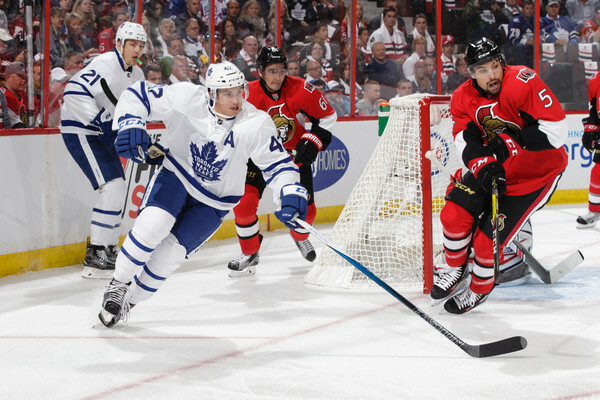 Could the Leafs and Senators make a trade? TSN 1050: Ian Mendes was on Toronto’s radio station discussing the Ottawa Senators. Mendes feels the Senators will look at trading Codi Ceci and the Toronto Maple Leafs could be interested. Mendes believes it would not take a roster player to land Ceci but a top prospect. Mendes was asked if the Senators would trade Erik Karlsson to the Toronto Maple Leafs. He said anything is possible, it would take William Nylander, + + +, to get him but he doubts the Senators would trade to their biggest rival. THE ATHLETIC: Marc Antoine Godin reports Montreal Canadiens general manager has told captain Max Pacioretty that he won’t receive a contract extension and the club’s intention is to trade him as soon as possible. Pacioretty’s new agent, Allan Walsh, declined to comment except to say his client loves Montreal and hopes to stay. It’s believed Pacioretty will seek a lucrative long-term contract after his current deal turned out to be one of the league’s biggest bargains. The 29-year-old left wing would prefer to re-sign with the Canadiens but there’s been trade speculation stretching back to December. Who will Luca Sbisa sign with? Andre Rufener, Luca Sbisa’s agent, told The Athletic’s Pierre LeBrun that GM George McPhee never made his client an offer. McPhee refuted that claim to reporters Sunday, saying he did offer the defenceman an extension but that Luca Sbisa has decided to move on. Regardless, here we are: Sbisa is one of the best youngish D-men on the open market. A Stanley Cup finalist, Sbisa logged an average of 19:31 in the 30 games he played and posted 14 points with a plus-8 rating.